Back before we had a drop shadow filter, we still used drop shadows but created them manually. Why would one want to do this now? In PSP 7 a drop shadow applied from the Effects > 3D Effects > Drop Shadow function only allows us to use a solid color for the shadow and the shadow becomes part of the layer/object its shadows. Using the old Manual method, we can create a shadow layer then fill it with gradient or texture fill as well as a solid color, then position and manipulate it separately from the text or object it shadows. Here is a way to do a drop shadow. Open a new file, with a white background, 24 bit color. For this exercise a 200 X 200 pixel at 72 dpi size file will suffice. 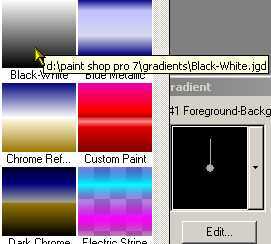 Pick the Text Tool from the Tool Palette on the left of PSP window. Click in the image to open the Text Entry Dialog box. Type in the word Shadow, or any other word you like in a bold heavy font like Arial black at a fairly large size. Be sure to check the Create as Vector Radio button at the bottom. to Solid Black with no foreground color. Pick the Preset Shape tool on the Tool Palette. On the Tool Options Palette, click the drop down arrow next to the shape preview thumbnail and pick a fun shape. Solid and bold will work best. then position it under the word shadow. Use the vector selector tool to move the individual objects around. On the Layer Palette, right click Layer 1. Right click the Copy of Layer 1 on the layer palette picking Rename from the fly out box. Rename this layer to Shadows. On the layer palette, click and drag the Shadows layer below layer one. to turn off its visiblility. Pick the Vector Selector Tool on the Tool Palette. 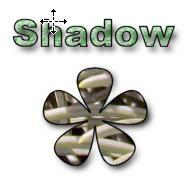 Expand the Shadow Layer by clicking the plus sign next to the layer name. Select the shape sub layer. In my case, Flower. indicates which object is selected. click the right facing arrow next to the Fill Style, choosing Gradient from the pop out box. Click directly on the swatch to open the Gradient box. On the Gradient box, click the down facing arrow next to the thumbnail. Choose Black and white gradient from the flyout box. On the Gradient box, set the style to linear, Angle to 0 and Repeats to 3. 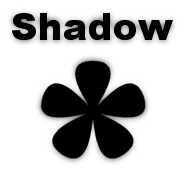 Press OK to change the fill for the Flower (shadow). With the Vector Selector Tool, click on the Text. Pick Properties from the Options palette. Set the Fill to Gradient and use the same gradient settings as the flower, except set the repeats to 2.
the glasses icon getting rid of the red x. On the layer palette, be sure the Shadows layer is selected. 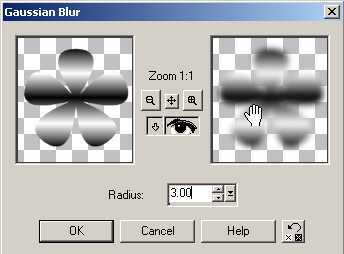 Go to Effects > Blur > Gaussian Blur... to open the blur box. On the dialog box, set the Radius to 3 and press OK.
is peaking out from behind the text. On the layer palette, select Layer 1.
to move the text and shape up to the left a bit. Use the transparency slider bar on the layer palette next to the Shadows name to adjust the opacity of the shadow. Feel free to edit the color and fill of the text and shape on Layer one. to adjust its position as needed. Here is a feature I never covered before. : Layer Grouping. Once the text shape and the shadows positioned properly, rightmost the last tab on the layer palette. The Grouping tab. The Group tab controls the layer groups. "The Layer Group option lets you place layers into a group. When you use the Mover tool to drag one layer in the group horizontally, the other layers in the group move with it. You can combine all types of layers into a group. When you click the Layer button of a layer that is part of a group, the Group tab displays a red dot . To group layers in an image, click each layer’s Group button on the Group tab of the Layer palette. The button changes from “None” to a number . All the layers having the same number on their Group buttons belong to a single group. Each time you left-click a Group button, it changes to the next higher valid number." In our case, click the word none next to Layer 1 once to pull up the number 1. Note that a red dot appears next to the icon in the tab. Click the None next to Shadows layer to give it a 1 as well. These two layers are "grouped" and will move together when using the the 4 headed Mover tool. Try it. Now the shadow is "attached" to the vector layer, but you can still edit the vector objects directly using the Vector Selector tool. Neat Huh? Save the file in the psp format to preserve the layers and the linking. Or export to Gif/JPEG to save a merged image.